Rose of Sharon, sometimes hyphenated to Rose-of-Sharon, is a delightful summer-blooming garden shrub. 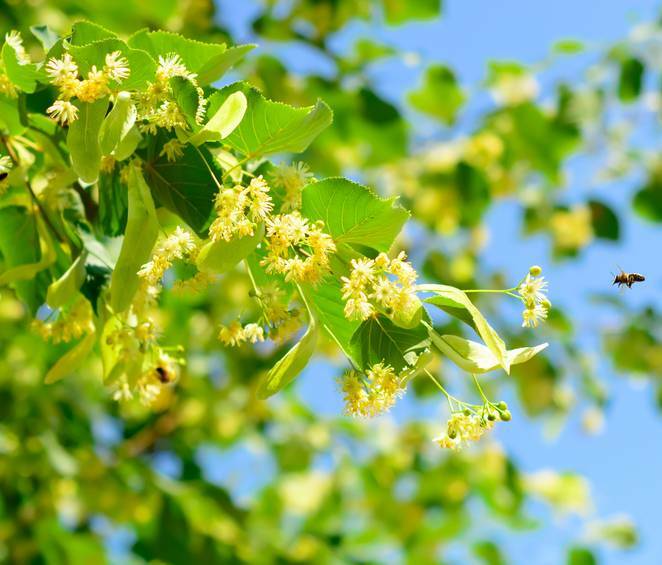 This blooming shrub has been listed as noteworthy by ancient Greek men of science. Its beauty led it to be cultivated in gardens of Mesopotamia and the Renaissance saw it spread across Europe. 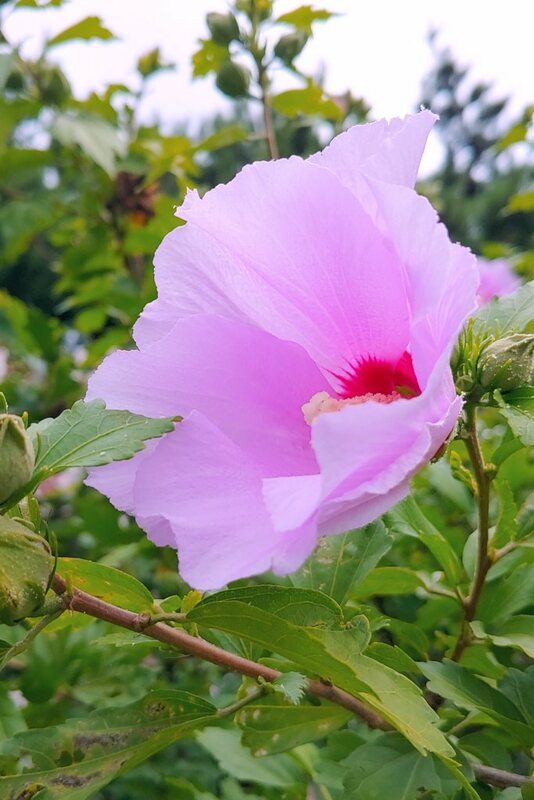 Rose of Sharon is native to semi-tropical regions (Southern China, Northern India). It’s used to getting a lot of light. Full sun suits Rose of Sharon best. It tolerates part shade, but won’t do very well in areas that are constantly overshadowed. In many places, Rose of Sharon is planted along roads and highways where it thrives and brings beauty to daily commutes. Some Rose of Sharon varieties are hardy down to 20° F (-5 or -6°C), these can be planted in the ground in most parts. Non-hardy varieties will have to be grown in containers. Plant your Rose of Sharon shrub in Spring for best growth, but Fall is also a good option. This step is important. Check how to plant shrubby trees. Proper drainage helps keep Rose of Sharon safe in winter, but doesn’t matter in non-freezing areas (as long as proper exposure is provided). Many of the wildly attractive blooming Rose of Sharon varieties are tropical hibiscus hybrids and aren’t quite as hardy. Container growing makes it easy to bring them indoors for the winter, where you can store them in a greenhouse or lean-in. Any regular, healthy soil mix will do. Double-check that drainage works and excess water flows out freely. Repot every year, or ever two years, to replenish soil nutrients. The constant summer blooming drains soil nutrients fast, so repotting is an important step to ensure abundant blooming. For larger pots, consider topdressing with rich compost. Rose of Sharon is a plant that likes water and doesn’t cope well with extended drought, especially for younger specimens. Old Rose of Sharon shrubs can survive moderate droughts well but young plants need daily watering. Water in the evening to conserve water without losing it to evaporation. Mulch with organic mulch, clay pebbles to lock moisture in, but avoid mineral mulch which might weigh down on roots and provide excessive mineralization. 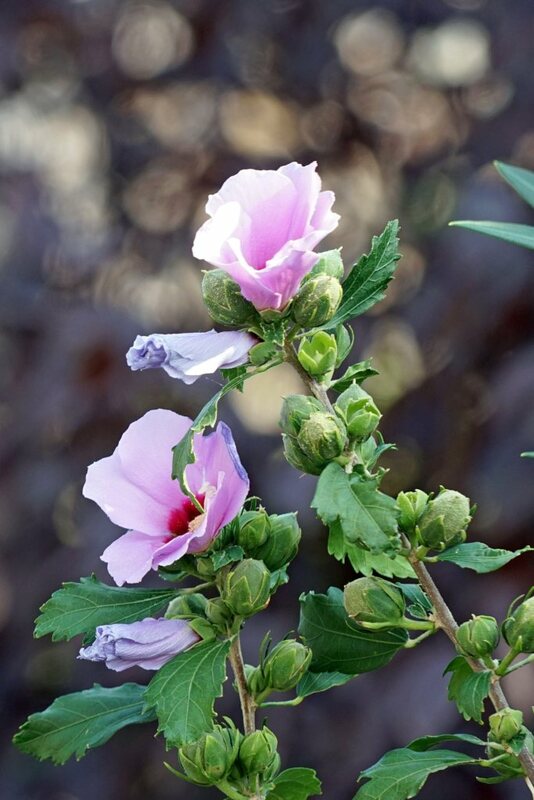 Rose of Sharon is rather sensitive to water that is excessively loaded with salts and minerals. It’s best to collect rainwater in the garden to give it pure, mineral-free water! When grown indoors in pots, it helps to provide moisture to the air around the plant. This helps recreate moist environments that some tropical Rose of Sharon varieties are native to. Rose of Sharon, while it isn’t a tree, can grow impressively large. It’s a bit like jasmine in that respect, reaching sizes of 6 feet across and 12 feet tall (almost 2 meters wide and 4 meters tall). When well settled in, in a suitable environment, Rose of Sharon will grow multiple trunks and turn into a dense flowering thicket in under 5 years. Pruning is important to contain this and keep a nice, clustered bearing. Pruning in spring is the best time. 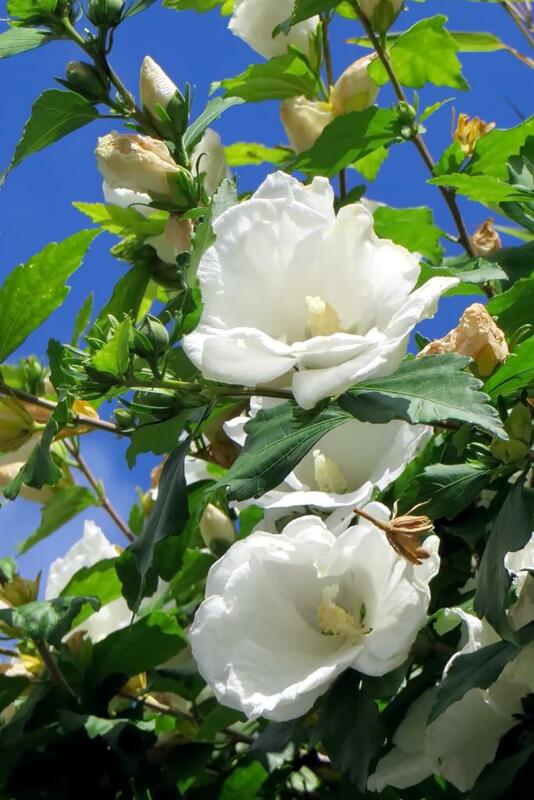 It ensures your Rose of Sharon won’t suffer from frost at the wounds, while still giving plenty of time for new wood to grow. Blooms appear on new wood. Prepare sharp pruning loppers or garden shears. Remove small scraggly stems and dead wood that may have died off in winter. Cut two-thirds of each stem off the Rose of Sharon, just above a bud. Select a few key stems to form a bowl-like shape, and remove most of the center ones to let light shine through the entire plant. It’s also possible to work with Rose of Sharon into espalier shapes. This is nice and rather uncommon for Rose of Sharon, so pruning it into palmate patterns or along a wall will make for a surprising and appealing impact! Rose of Sharon, when used as a flowered hedge, will only provide privacy when diligently pruned to branch out a lot. It’s a good solution to separate portions of a garden without completely shutting each out. Some Rose of Sharon varieties are infertile, which means seed pods don’t fully form. But most varieties actually go to seed very successfully, and quickly spread seeds around them when the pods burst open. To limit the spread of your Rose of Sharon plants, remove wilted flowers regularly, or at least towards the end of summer. Removing wilted flowers will trigger more blooming, even in the case of sterile varieties. Rose of Sharon bears a name that draws back to near-mystical times. It’s actually named after a flower mentioned in the Old Testament of the Bible, in the book of Salomon. 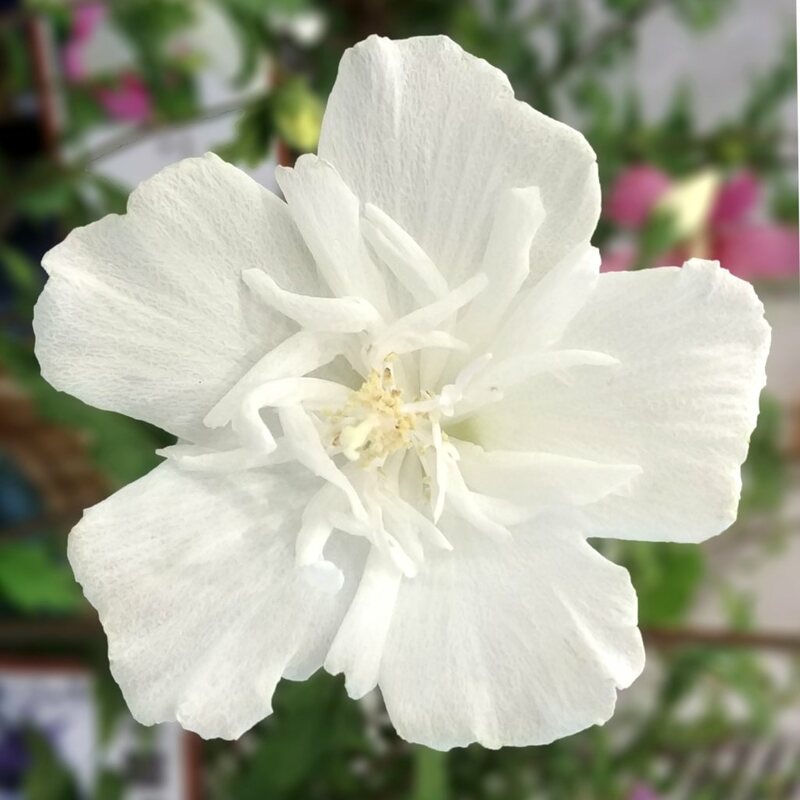 Sharon refers to a place in the Middle East that was rich and fertile, and the unceasing blooms of the Rose of Sharon highlighted this abundance. Rose of Sharon can be used in hedges, as a standalone and it can also be added to a sun-endowed shrub bed. The more sun it gets, the more flowers it will bear! Diseases and pests are almost never a problem to the Rose of Sharon Hibiscus. Try sprouting some of the seeds and let them reach blooming age. In many cases, flowers will grow in new colors and shapes compared to the mother plant!